I could use some help please. I have two of the exact same Rokus they are Roku Premier Plus that runs on gigabit internet connection wired. I have one device that constantly transcodes and one that direct streams. I checked all the connections and I get great speeds like 800-900+ down and up on each box. So I don't know how that is it. Would there be something I could do with codecs or something? Log attached! Actually before you do this, please check your emby server dashboard during playback and it will tell you why it is transcoding. That is a great self-service way to find out on your own. If that doesn't satisfy you, then please provide the requested information. Thanks. Thanks @Luke, I checked and It looks like it might be a media format. That doesn't make a whole lot of sense since this is two of the same rokus. I have attached screenshots, server and transcode logs. What are the two models? Check the playback settings in the app. The one that is transcoding is requesting a 3.5Mb/s max bitrate and the stream is 8. 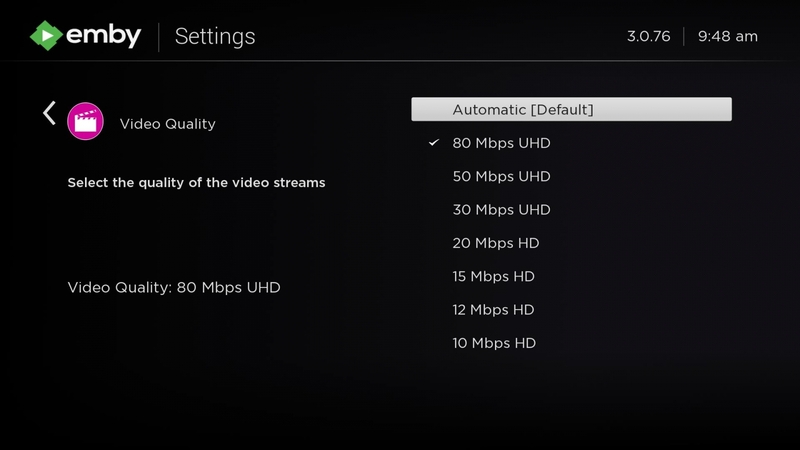 @ebr I am sorry I don't see anything talking about bit rate in the settings. Where would I change that setting? @ebr and @Luke That did the trick! Thank you very much! @ebr is there a reason that automatic settings isn't picking that up? If the auto setting was coming up with that smaller number then it is possible that some bottleneck exists somewhere that will make video not play properly at a higher setting. The app tests the speed of communications with the server periodically and uses the results of that test to set the bitrate.